You need to find Dell Service Tag if you purchase a new Dell laptop like this one, and you’re in the USA, that will provide you many information, like warranty, your Dell laptop model, the compatibility, upgrade options, etc. To have this option, you will need a unique number, which contains 7 characters to identify your laptop. Although in the product support knowledge base, it states not all Dell products have this unique tag, but for laptops and computer, they have Service tag. Once you find Dell service tag, it will make support process easier, not only your computer will be properly identified, but they will also provide the proper support, either via phone support or their support website page. For laptops and desktops, they are usually placed on the back of the laptop, or the desktop’s rear area. If you use other than this, you may watch this Dell’s official video tutorial to find Dell service tag. The problem that may occur, is the paper is missing, or you can’t read this information for some reason. Therefore, you can also find this detail with Windows command Prompt. 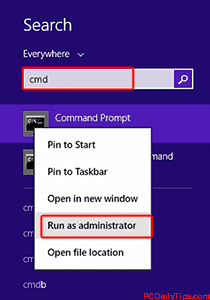 In Windows 8, you can look for “cmd” in search of charm bar, and once you find it, click it to open the Command Prompt. 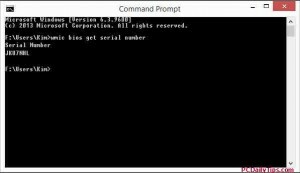 See another tips of Command prompt. With this command line, you can find Dell service tag which is 7 unique characters as shown below in the screenshot. Now, if nothing helps, contact their support immediately.